I used to shy away from devotional books. It was one of those things my former church really didn't talk about so I didn't put much thought into them either. Then a sweet friend mentioned one on social media and I started looking into them. Since then I've fallen in love with daily devotional books. I love the short sweet message they give and the way they encourage quality time in God's Word. VeggieTales has a two sweet devotionals out in their Every Day With God series. There is 365 Daily Devos for Boys and 365 Daily Devos for Girls. Share these faith-filled VeggieTales devotions with your little one, encourage him to spend time with God each day. 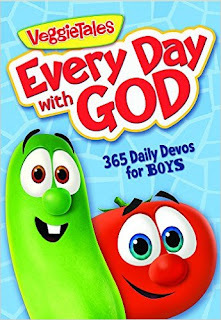 Each short reading is made relatable with the VeggieTales characters and child-friendly teaching -sure to help every boy learn more about God's love. This soft bound book comes in two choices - boys or girls. This devotional has become a fast favorite. The cute veggietale characters that on each page draw my little one's attention. He wants to see who is on each page. The messages are great. The only thing we have to do is use our bible since it is not KJV (so few things are). I really like that each devotional is numbered rather than dated. This makes it easy to start any time of year and dive in. 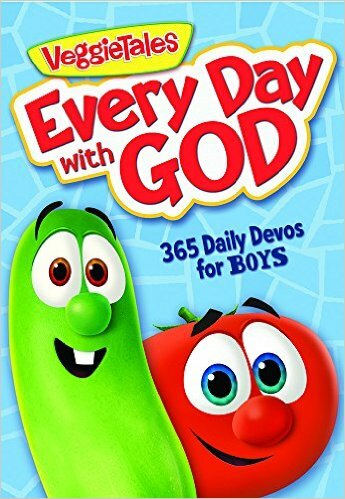 You can get your copy of Every Day with God Devotional for Boys or Girls at your local retailer or online at stores like Amazon! 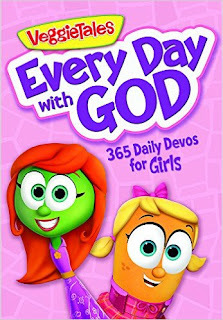 One lucky reader will win their choice of devotional - either boys or girls! I would choose 365 Daily Devos for Girls. I would choose the 365 Daily Devos for Boys!